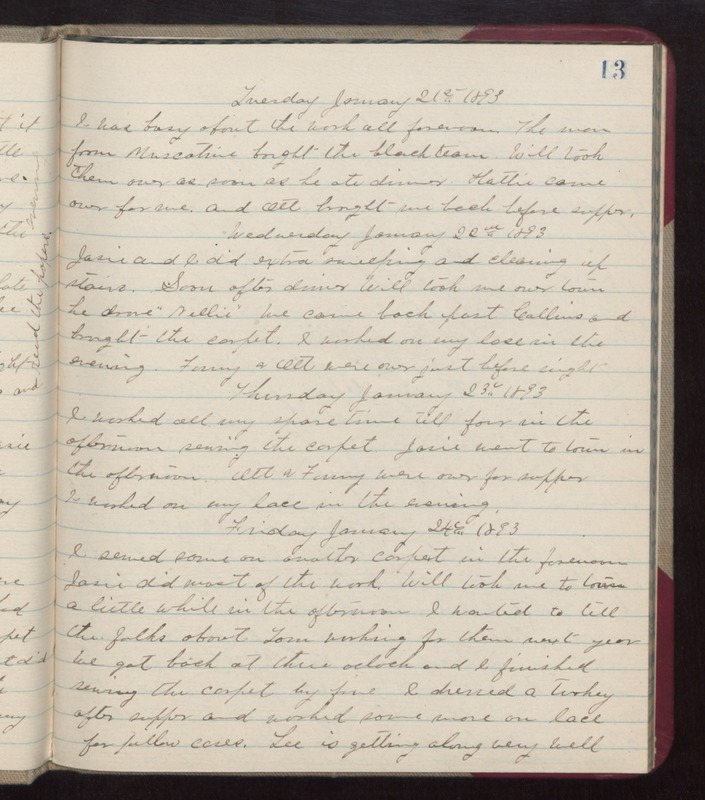 Tuesday January 21st 1893 I was busy about the work all forenoon. The man from Muscatine bought the black team. Will took them over as soon as he ate dinner. Hattie came over for me and Ott brought me back before supper. Wednesday January 22nd 1893 Josie and I did extra sweeping and cleaning up stairs. Soon after dinner Will took me over town. He drove "Nellie" We came back past Collins and brought the carpet. I worked on my lace in the evening. Fanny & Ott were over just before night. Thursday January 23rd 1893 I worked all my spare time till four in the afternoon sewing the carpet. Josie went to town in the afternoon. Ott & Fanny were over for supper. I worked on my lace in the evening. Friday January 24th 1893 I sewed some on another carpet in the forenoon. Josie did most of the work. Will took me to town a little while in the afternoon. I wanted to tell the folks about Tom working for them next year. We got back at three oclock and I finished sewing the carpet by five. I dressed a turkey after supper and worked some more on lace for pillow cases. Lee is getting along very well.